Give this heart shaped Hand Cut Lace pendant to a lucky girl. This pendent says "I Love You". 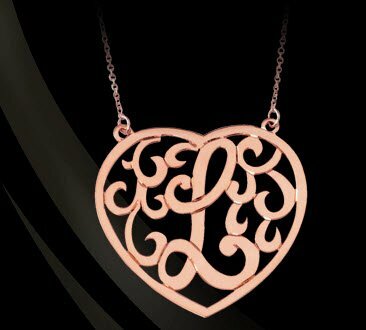 This lace heart pendant has a single letter choice only . The letter in the heart pictured is a V.
This pendent is available in your choice of four sizes ranging from 3/4" to 2" and can be made in sterling silver, gold plated or 14K gold. The necklace is on an 18 inch split chain. Please allow 3 weeks for this necklace to be made and delivered. Price: $136.00 In stock! - Browse this brandOur products are custom made to your specifications. This product ships up to 3 weeks after your order is placed.